Marilyn is in search of freedom. She grew up as a child actor, her mother’s meal ticket out of mediocrity. But it’s been a long time since she booked a job, and she and her mother have no choice but to move in with her volatile uncle. Angie is in search of answers. She is mixed race and has never met her father, but she knows she looks and thinks a lot like him. Though Angie grew up with her devoted mother, Marilyn, she’s always felt the absence of the man she never knew. After having the opportunity to review this book I immediately accepted because the synopsis won me over. In Search of Us sounded something a bit different from the usual contemporary read because its about a mother and daughter relationship. It also had the summery vibe about it, and I thought it would be perfect to read in the nice warm weather. What I really loved about In Search of Us is the mother and daughter story, its something that is not always visible in contemporary YA books. Most books the parents always seem to be in the background and not really anything to do with the plot, whereas in this there is a strong relationship and storyline between Angie and Marilyn. The story is told from both the perspectives of the mother and the daughter, and I think this is why I enjoyed this book. You get to know both characters really well and both have some interesting and intriguing stories. 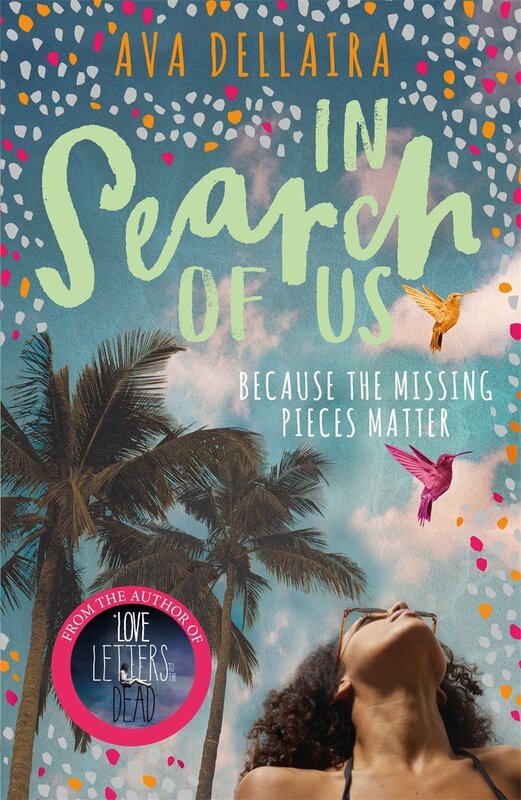 In Search of Us is told by both the characters with their own stories but both stories are entwined together to make an enjoyable read. Marilyn’s story is about her early life and how she met Angie’s father, whereas Angie’s story is about discovering her uncle is a live even though her mother had previously told her that he was dead. I read this in just a couple of sittings because I found to be an easy and quick read. I found both plots to be intriguing and I really liked reading them both. I thought that dual perspective helped move the plot along and I didn’t become bored and felt the plot moved along nicely without any lull. This is the first book I’ve read by Ava Dellaira and I am so happy I got the chance to read this because its made me want to to read Love Letter to the Dead by the same author. I found the writing to be very description but not overly to dull down the plot or the reading pace. I flew through this book and one reason for this was because the writing was such a pleasure to read. Both the story and the characters were fulled developed and fully fleshed out and it was hard not to fall in love with both. If anything I would of loved the book to be a little longer just so I could spend more time reading about the characters. I would definitely recommend this book for readers who are looking for something different from the usual contemporary YA books. In Search of Us has a really strong mother and daughter relationship, with a really interesting story. If you are looking for a quick and fascinating book to read this summer, then I would say that In Search of Us is a perfect read for you.